With 12 pitches of 5.13 or harder including two 5.14a’s in the mix, Magic Mushroom is about as sustained as free climbing on El Cap gets. 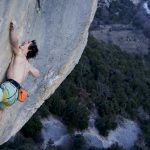 The Austrian climber Barbara “Babsi” Zangerl and the Italian climber Jacopo Larcher have made the first repeat free ascent of Magic Mushroom (VI 5.14a), arguably El Capitan’s hardest free climb after the Dawn Wall (VI 5.14d). First freed in a team effort by Mr. El Cap himself, Tommy Caldwell, and Justen Sjong, Magic Mushroom contains 12 pitches in the 5.13 or 5.14 range, and another eight in the 5.12 range. 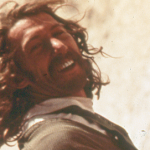 Steve Sutton and Hugh Burton established Magic Mushroom as an aid line in 1972, at VI 5.7 A3. In May 2008, armed with beta from Adam Stack—who had put in substantial efforts towards freeing it himself in the preceding two years—Caldwell and Sjong teamed up and, after weeks of working the line, freed it in a five day push, swinging leads. 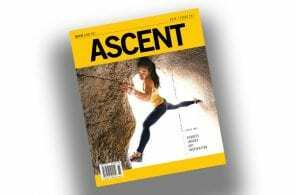 The 2,900-foot free variation they pioneered climbs roughly 70% of the original aid route, taking a direct line just to the left of the Nose (VI 5.14a) on the monolith’s famous prow. The following month, in June 2008, Caldwell returned and pulled off the superhuman feat of leading every pitch free in a single day, topping out in just 20 hours and two minutes. Though Zangerl and Larcher’s aspirations were slightly more modest than Caldwell’s single-day ascent, Magic Mushroom was still a monumental undertaking for the two. 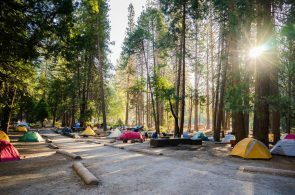 Zangerl’s original objective in Yosemite this year was to free the Nose, but, put off by the hordes on the popular trade route, agreed to check out Magic Mushroom with Larcher. The pair went ground up on Magic Mushroom. Their first time up the wall was a combo free-aid affair: freeing some pitches right off the bat, aiding others and installing the necessary protection (often beaks in the harder pitches) for freeing it later on, and starting to work the moves on the harder pitches on toprope. 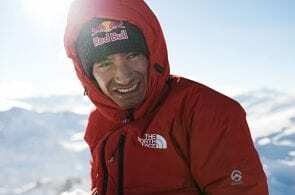 After a quick break back on the ground, Larcher and Zangerl went bottom to top a second time, this time spending eight days on the wall as they each refined beta. They started up the wall a final time on November 29. 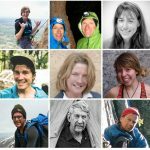 The style in which they climbed has become the most popular in El Cap free climbing in recent years, largely following Tommy Caldwell and Kevin Jorgeson’s example on the Dawn Wall: each climber led all the crux pitches (in Zangerl and Larcher’s case, they each led and freed the twenty 5.12, 5.13 and 5.14 pitches), and followed cleanly any others. They got to Mammoth Ledges on the first day and to their portaledge just beyond Grey Ledges on the second day. “Jacopo spent some time on the 5.13c, so we spent an extra day there and he sent it the next day,” Zangerl says. They then climbed steadily through the majority of the route until the last hard pitch—the 5.14a that Zangerl still hadn’t done. She failed at the same hard sequence on her first two attempts. Realizing that what she was doing wasn’t going to work, she spent one-and-a-half hours puzzling over two moves, eventually finding new beta. “My new solution involved a different foothold, so I didn’t need as much pressure on my feet and didn’t need as much body tension. It wasn’t as powerful,” she says. 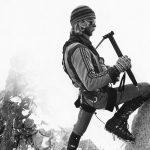 With Magic Mushroom, Larcher and Zangerl have cemented their status as two of the most successful El Cap free climbers to date, and one of the most notable partnerships since the Huber Brothers. In 2015, they made a free ascent of El Nino (VI 5.13c A0), and in 2016 they made the third free ascent of Zodiac (VI 5.13d). The most recent, wildly impressive non-Yosemite climb that the two sieged together was Gondo Crack (5.14b R), a single-pitch, bolted project in Switzerland that each of them freed on bolts first, and then later on gear, for its first and second ascents. Individually, their resumes are also world class. Larcher has climbed numerous 5.14d’s (9a), including Helmutant, in Italy, and Southern Smoke Direct, in the Red River Gorge, Kentucky. 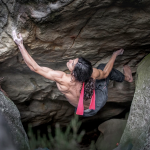 Trad-wise, one of his finest ascents was a 2016 repeat of Rhapsody, Dave McLeod’s bold E11 7a (5.14+ R) at Dumbarton Rock, Scotland. For her part, Zangerl has been a major trailblazer: she became the first woman to climb V13 when she sent Pura Vida, in Switzerland, in 2008; the first woman to send the Alpine Trilogy—Silbergeier (8b+/5.14a), in Rätikon, Switzerland; End of silence (8b+), in the Berchtesgaden Alps, Germany; Des Kaisers neue Kleider (8b+), in Wilder Kaiser, Austria—in 2013; and the third woman ever to climb 5.14 on gear (after Lynn Hill, with the Nose, and Beth Rodden, with the Nose and Meltdown), when she sent Prinzip Hoffnung (8b+/5.14a), in Bürser Platte, Austria, in 2014. What Zangerl and Larcher will tackle during their next trip to Yosemite, whether that’s next year or further out—is still a question mark. “I want to climb an easier route next time,” Zangerl says, laughing.